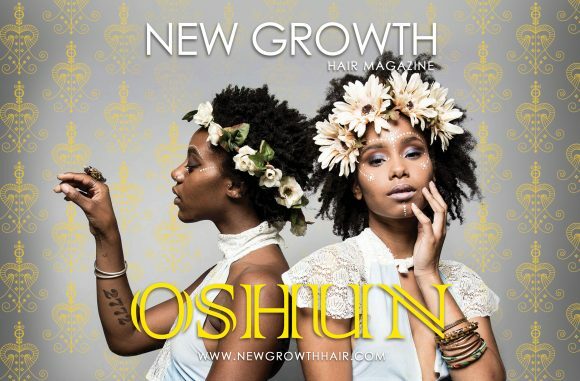 Niambi and Thandi are OSHUN | New Growth Hair Magazine | We capture the culture of urban barbershops and beauty salons. Niambi and Thandi are returning to their African roots to inspire and uplift their generation through music, film and social activism. Both Oshun members are recipients of NYU’s Martin Luther King, Jr. Scholarship. They met each other at their scholarship orientation and quickly developed a bond of sisterhood. Niambi and Thandi’s similar background, shared purpose, musical interests, and passion for social activism led to the creation of Oshun, a musical group that is a fusion of Hip-Hop and Neo-Soul. In only two years, Oshun’s music videos have been watched by more than one million people. Isis Brantley introduced me to Oshun’s music. After watching their videos, I fell in love with Oshun’s music and message. 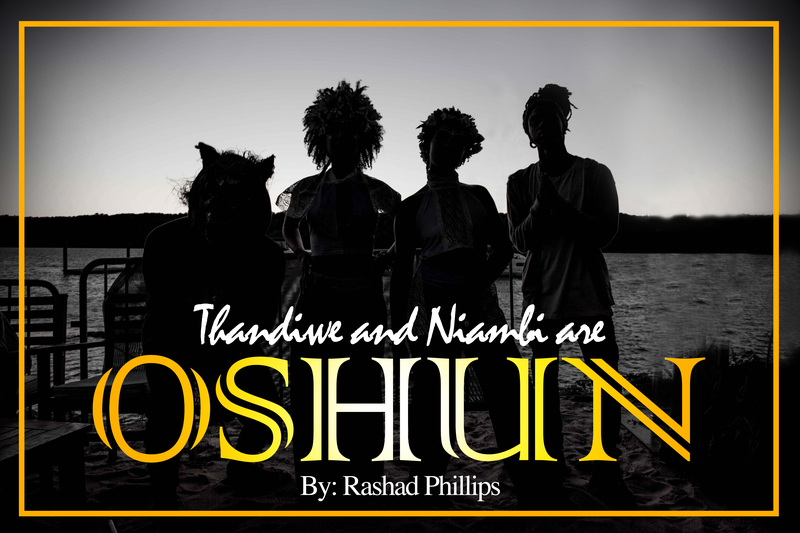 Oshun is a musical extension of Erykah Badu, Lauryn Hill, Soul II Soul, Public Enemy, X-Clan, and Arrested Development. Niambi and Thandi are the perfect musical combination to take listeners on a musical and spiritual journey. Phillips: What inspired you all to name your group Oshun? Niambi: Both of us are passionate about social activism. We want to have success in social justice and the empowerment of our people. We both came with that knowledge before we even got to New York. Our story is an interesting one. Two 17-year-old girls from Maryland, who didn’t crossed each other’s path until college discovered that we shared a similar vision. Our friendship grew as we began to get to know each other while exploring New York City. What really connected with us was the concept of the Orishas and African spirituality, which helped us to find our mission in New York. On a subconscious level, Oshun brought us together and began to communicate with us. Music was a vehicle for us to receive intuitive messages from our ancestors. In Haiti, in the struggle for independence, our ancestors called on Orishas to fight our enslavers. As social activists, we call on Orishas to help us with our modern freedom struggle. Both of us wanted to bring about change inside and outside of the classroom. We didn’t just want to be Afrocentric or artsy, we wanted to represent the real. We are activist at the core. At that stage in our lives, we were young women in the process of becoming. We were transforming from children to young women who were learning to embrace our femininity. We were in the process of finding ourselves, finding and living our purpose, exploring, and growing. We were both seeking something and we found Oshun. Phillips: What does your hair represent? What does your hair say about you? Niambi: I think your hair represents how you take care of yourself and how you perceive yourself. Our hair are antennas that connect us to all things higher. We have a physical relationship with our hair and our hair has a spiritual relationship with all things higher. Our hair connects us with our environment and our people. Unfortunately, as a people, we are disconnected from our hair, our environment, and our community. Thandiwe: Also, your hair represents growth because it literally grows from inside of your body. Hair is an antenna because it sprouts outside of you and connects you to the physical and spiritual world. Some women don’t want others to touch their hair because someone’s touch might interfere with their connection to their internal world. My family is from the South. Back home in North Carolina and Virginia, I was raised on creamy crack [chemical relaxer], because you had to have your hair looking nice. In high school, I didn’t like how my hair looked. I can’t remember the exact moment, but I knew that I had to be real with myself. So I cut off all my hair and I had a small little baby Fro. It’s been amazing to see how much my hair has grown. Now, I have multiple Locs in my hair. I have this one Loc that I started as soon as I got to New York. So for me, one of my Locs represents my experience in New York. Phillips: How did you feel when you were bald? Did you feel less feminine? Did you feel less beautiful? Was there any change? And how did you perceive yourself? Niambi: I felt more beautiful and more feminine. It was a point where I had no option but to accept and to really get to know myself. I was forced to look inside and not get distracted by what was going on outside. It was just me and my reflection, nothing else. That was a challenge in itself because I became comfortable with just being new. It was a state of rebirth. But I couldn’t be a baby forever so eventually I let my hair grow. My hair has never been like this before. It’s kind of reminiscent of how my hair has lived in the past. But it’s like a whole new life. The decision to cut off all of my hair brought about a transformation, allowing me to destroy what was feared previously so that I can build anew. Phillips: How do you all balance school and music? Niambi: We just don’t sleep. Thandiwe: We have to be understanding with ourselves. It’s like we can’t do everything all the time. Sometimes, we have to sacrifice things that typical college students do so that we can pursue our passion for music. Sometimes, we just have to sit down and take a break because balancing school and music can be exhausting. But for the most part, the people in our environment, career wise and in our academic setting really understand. Our team understands how hard we’re going. It’s been a learning process. We’ve learned that the less stress we put on ourselves, the more we are at peace with what we are doing. In the beginning, it was a lot because we felt like “Oh my God, we’re students and artists. We have to do our homework and we need to create. We’re going to fail!” Then we learned to trust ourselves and we knew that everything was going to be alright. Niambi and I started this musical journey together as freshmen. Now we are approaching our senior year. Once we were at peace with ourselves, balancing school and music became more manageable. Phillips: After listening to your music and watching your videos, it appears that you two are more than just musical partners. It seems like there’s a bond, a sisterhood. Can you talk about that? Niambi: Yes. So we were friends before we created Oshun. We didn’t just decide to form a group the moment that we met each other. We met at NYU for scholarship orientation because we were both awarded scholarships. We were excited because we received scholarships to the school that was our first choice. We were both blessed with an opportunity to attend NYU and to meet each other. We became sisters when we realized that we were from the same place, have mutual friends, and shared common interests. Both of us were thinking about getting the same tattoos when we got to college and we had the same reference picture in our phones. It was weird (in a good way) to have so many shared interests. Thandiwe: Once we got to NYU, we just clicked. It was like an automatic sisterhood and shortly after meeting we became close friends. Niambi was already doing music because she was a student for recorded music. I wasn’t making music but I just jumped right in. I just told myself that I’m going to dive in and see what happens. In the past, I wanted to make music but I would always doubt myself. Back then, I was in a pessimistic phase. I’ve not always been an optimistic person. I am sure that’s one of the reasons Niambi and I met was for her to help me realize that I could make music. Before I knew it, I had conquered my fears and we were making music. We also have a bond that’s beyond the physical realm. We definitely have been down for a long time. We’ve been sent here as a team for a divine reason. And we feel that, it’s just like there’s a recognizable connection that we have that transcends music and the physical world. Phillips: How do you define beauty? And how are you infusing beauty into your music? Thandiwe: That’s a great question. I think beauty is acceptance. As women, sometimes we struggles with seeing our body, our hair, and ourselves as beautiful because we haven’t learned to accept ourselves. Niambi and I are on a journey of connecting with ourselves and we really just have to come to terms with ourselves. We started on this journey of acceptance shortly after I cut my hair. The journey of accepting myself, my hair, and my musical talents was very much in alignment with our journey. We have been and are now recognizing and accepting ourselves as beautiful. We are loving ourselves without conditions. We are so in love with ourselves that we can share our love with the world. So the fact that we’re sharing ourselves fearlessly is a huge way that we’re incorporating beauty, standing for beauty, and exemplifying beauty. And then also just exploring our femininity and being willing to share that as well. Our music is a reflection of our journey toward womanhood. Because you got to remember, we were just kids. Even in high school, you think you are grown or whatever but you’re actually a child. We’re fresh out of that stage. We’re fresh to the world. Just being able to live on our own with ourselves and wake up every day and are in charge of our own lives. And so, we’re exploring femininity in an entirely different way that really didn’t exist in our spaces before. It’s all a journey and we’re sharing our journey.